Welcome back everyone after a very long Christmas break! Carlow was the coldest county in Ireland last week! Everyone is now back at work and the time is just flying. Here are some of our latest news items. 1:Doodle for Google. Well done to 6th class student Diarmuid Farrell who was the only successful primary student from Carlow who made it through the first round of the Doodle for Google competition in Ireland. 2: St. Brigid Crosses. The boys from 6th class will be busy making St. Brigid crosses for the 1st of February. All proceeds will be donated to the Haiti Emergency Fund. 3: Holy Family BNS’s Parent’s council will be holding a table quiz in Éire Óg on Friday 5th Feb. Everyone welcome for what will be a very enjoyable night. 4: Holy Family BNS will also be holding a no uniform day as a fund-raiser for the Haiti Emergency Fund. 5: Soccer and Hurling leagues will commence next week for the senior pupils. 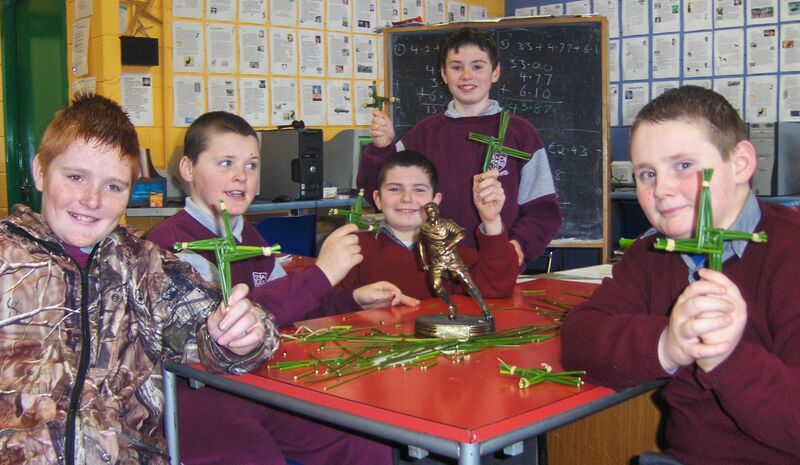 Photo shows sixth class pupils making St. Brigid Crosses.